The German Shepherd is a breed of medium to large-sized working dog that originated in Germany. It is the second most-popular dog breed in the USA and is extremely popular in South Africa. The GSD is a versatile and enthusiastic worker and because of their strength, intelligence, trainability, and obedience, German Shepherds around the world are often the preferred breed for many types of work. They are used for disability assistance, search-and-rescue, police and military roles. Added to this the GSD is a marvelous family dog and can even act. German Shepherds are still used for herding and tending sheep. In South Africa many are used in IPO (internationale prüfungsordnung) competitions (much like Schutzhund trials. When choosing a German Shepherd Dog (GSD) as your canine companion temperament is paramount. The GSD is a working dog. He looks for a job to do. He is not for the novice dog handler nor is he for the person looking for a couch potato. To follow are a number of characteristics you will find in a well-bred German Shepherd. Most are positive and some can be problematic if you do not offset these tendencies with proper training and socialization. Courageous, fearless and focused. Because of these traits GSDs are used in military and law enforcement operations. They were originally required to face wolves in their capacity as sheep herders. They have a keen sense of smell and are often employed in search and rescue missions or to detect explosives. Because of their ability to focus GSDs also make good service dogs for the visually impaired. Alert, intelligent and trainable. These traits will require that your GSD is kept mentally active and one of the best ways to achieve this is with daily training session. Play games and teach many new things in order to prevent boredom and possible negative outcomes of these characteristics such as incessant barking, digging and compulsive behaviour. GSDs are sensitive by nature so ensure lots of treats and mind games are available if you leave the dog alone. Separation anxiety may become an issue. Well-built, strong and energetic serve the dog well in any environment. GSDs require physical stimulation so budget at least an hour per day for physical activity. Add variety by choosing walking or running, obedience training, swimming and anything else your dog enjoys. Loyal and protective. GSDs show a natural indifference to strangers coupled with a strong protective instinct of their family. They can be loyal to one person in particular. These traits can spill into overt aggression if your young dog is not properly socialised. It is important to enrol you and your GSD at a suitable and established training school as young as possible. German Shepherds can generally coexist peacefully with other animals as long as they receive proper introductions, training and management. German Shepherds require input and attention and you will be rewarded beyond measure. 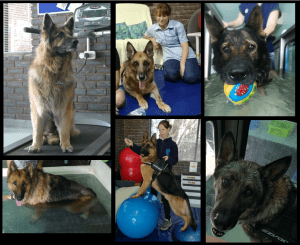 A final word on health problems in GSDs. Many of the health issues seen in GSDs are as a result of inbreeding practised early on in the development of the breed. These include hip and elbow dysplasia, lumbosacral stenosis and degenerative myelopathy, as well as a tendency to develop Hansen type 2 intervertebral disc disease. There are other medical problems which affect cardiac function, vision and digestion, and the tendency to develop perianal fistulas and haemangiosarcomas (a type of cancer). Just as breeding can affect temperament so too does poor breeding result in poor health. Research your GSD breeder well before investing.